Reid Longley is a PhD candidate in the MSU Department of Microbiology & Molecular Genetics. He is a member of the Bonito Lab. Reid wrote about his research at the KBS LTER, funded by a 2018 Summer Fellowships for Long-term Ecological Research. Performing my field research at the W.K. Kellogg Biological Station (KBS) this summer was the first time I had ever been exposed to work in agriculture. Before coming to Michigan State for my PhD studies, I had not thought much about the amount of science that goes into successful agricultural production. It involves everything from plant breeding and genetic modification to create new crop varieties, to the design of new pesticides and fungicides to protect our crops from pests that can drastically reduce yields. Although I am interested in these topics, my true passion within the field of agriculture is in the microbial communities associated with plants. These communities are perhaps most well known for the devastation that they can cause in a variety of crops across the country, but microbial communities are also crucial to a plant’s well- being. My research at KBS this past summer focused around studying the microbial communities associated with soybeans. 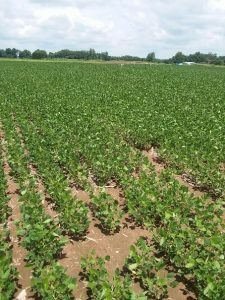 My research taught me that the communities associated with all parts of the soybean plant are complex, and made up of microbes that range from offering clear benefits to the plant, to pathogens, and everything in between. One aspect of my research that really drove this point home for me was creating culture collections of pure isolates from the soy-associated fungal and bacteria communities. 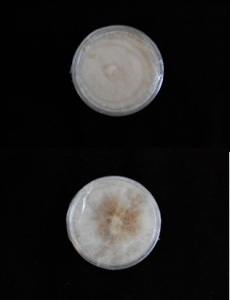 This work is ongoing, but so far, I have been able to isolate 418 bacteria, and over 400 fungi – and counting! Using the samples that I collected for next generation sequencing will give an in-depth view of the composition of these communities and how they change through time. Analysis of this data will identify microbial species which are important drivers of community structure. This baseline research completed at KBS could provide important insights into what combinations of microbes are most beneficial to increasing or maintaining crop yield. This research could then be implemented into decisions made by farmers with regards to their crops. My experience at KBS showed me how unique long-term research sites are and how important they are for studying ecology. KBS is particularly unique in this regard because tracking long term change at an agricultural site will provide vital information of how human agronomic activities are impacting the environment. This information will be vital as humans continue to decide how we can mitigate our role in global climate change. I believe that microbial communities can serve as important markers for climate change, and that sites like KBS are the best places to track how microbial communities are changing.